PRINCESS HELENA Autograph Letter Signed. Helena Augusta Victoria, 3rd daughter of Queen Victoria and Prince Albert. ALS. 2pp and integral blank leaf. Balmoral. May 20th 1864. To "Dearest Andie" [the pianist Lucy Anderson]. Together with an early carte de visite photograph. "I hasten to answer your letter I received yesterday, and to say that Mama does on no account wish the dressers to be changed. What dear Papa liked and ordered is too sacred to us to have them altered. About the other observation in your letter there is nothing to say, we quite understand everything. Please tell Mr Anderson I hope all will go off well and that I am very sorry not to be there. Ever your affectionate and grateful, Helena." 8vo. Approx 7.5 x 5 inches. Slight creases, else fine. The carte de visite photograph is by [John Jabez Edwin] Mayall of Regent Street, London. It is an early image of Princess Helena, dating from around 1860, a few years earlier than the letter. A nice image of the young princess, full-length, wearing a crinoline and reading a book. It is in fine condition. Queen Victoria had arrived at Balmoral from Windsor on May 15th 1864 (five days before the date of this letter). She was accompanied by her children Helena, Louisa, Leopold and Beatrice. A few months earlier, Victoria had discovered a flirtation between the 17 year old Helena and Prince Albert's German librarian, Carl Ruland. She had dismissed Ruland from his post and sent him back to Germany. 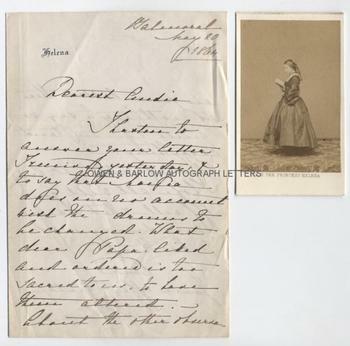 Here Helena is writing to Lucy Anderson (1797-1878) one of the greatest female pianists of the 19th century. Both Queen Adelaide and, subsequently, Queen Victoria had appointed Lucy Anderson as their piano tutor, and she had also taught the royal children, including Princess Helena. Music became one of Helena's greatest passions. Lucy Anderson (described as formidable and a manipulator of wide patronage) had retired in 1862 but her husband, George Frederick Anderson, had been appointed Master of the Queen's Music in 1848 and remained so until 1870, when he departed under somewhat uncertain circumstances. Princess Helena (after Carl Ruland's dismissal) was kept close to Victoria and acted, with Princess Beatrice, as an unofficial secretary to the Queen, often writing letters for her. The letter demonstrates a fondness between the young Princess Helena and her old music teacher, but the Queen's sharper tone can also be detected. Princess Helena became one of the most active of Victoria's daughters. She was a patron of many charities and was one of the founders of the Red Cross.